So that's why they're called performance boats! Just for the record, in case anyone was wondering, high-level sea kayak coaches know how to have fun, on the water and off. If we were in Great Britain, we'd likely have spent many hours in the pubs, being reminded that smaller paddlers can't hold their liquor as well as large ones. 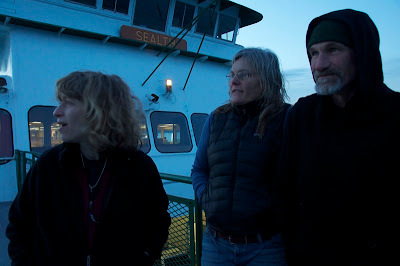 Fortunately, we were on Orcas Island with a couple of coaches who enjoy playing on their boats. So we did, too. Leon comes in for a landing. Shawna takes standing on the boat to a new level of complexity. Interspersed with the fun--and often during it--we talked about the hows and whys of various techniques. 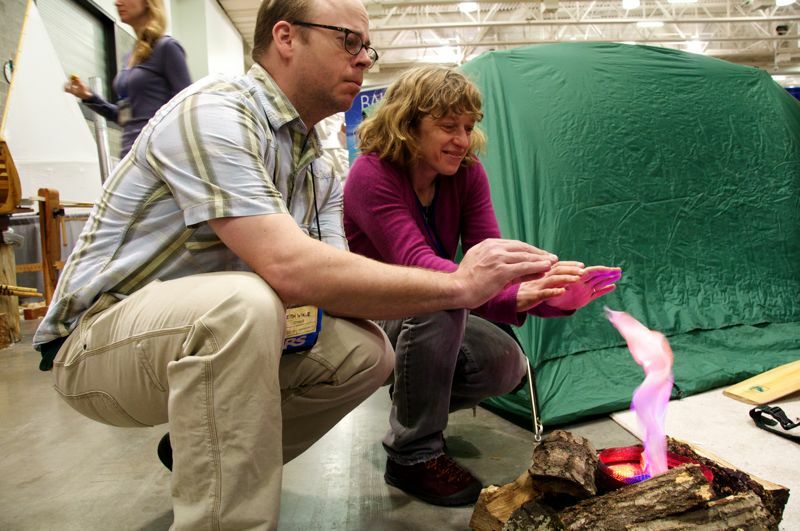 The experience was true to the BCU approach, which incorporates games as an integral part of learning. We're still processing the experience (and trying to get used to urban life again), but we know this: Shawna and Leon's playful, inquisitive approach to sea kayaking is inspirational to us as paddlers and coaches, and we definitely plan to return when we can. 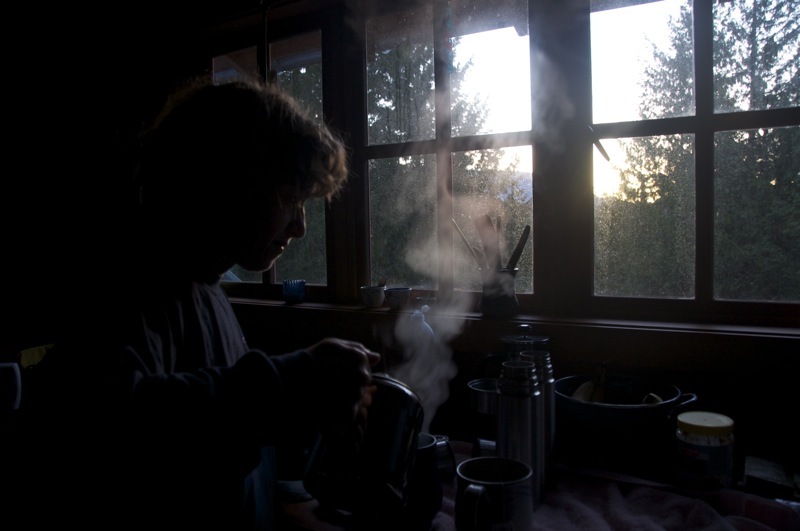 Making tea by the light of the rising sun. We're accustomed to camping, but there's something quite different and delightful about waking up in a building where candles provide all the light and a wood stove most of the heat. We boiled water on the Magic Chef stove for tea, and retrieved our soy milk from the cooler. The silence was more profound for the lack of appliance hum. No refrigerator, no furnace blower, just birds singing outside the windows. 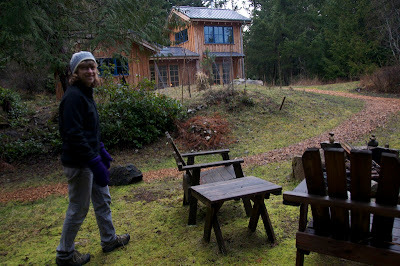 Shawna and Leon's house was a short walk down a moss-covered path through a stand of trees, or along a wood-chip path that took us past their compost pile, organic garden and outdoor hot tub. 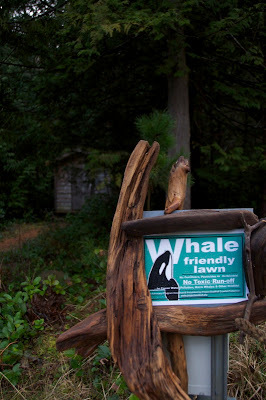 Either way, we passed the whale-friendly lawn. 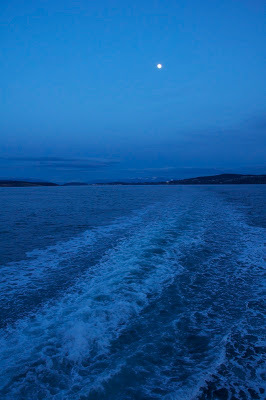 We didn't see any whales, but we're sure that they would have approved. The pesticide- and fertilizer-free lawn benefits creatures of the sea. 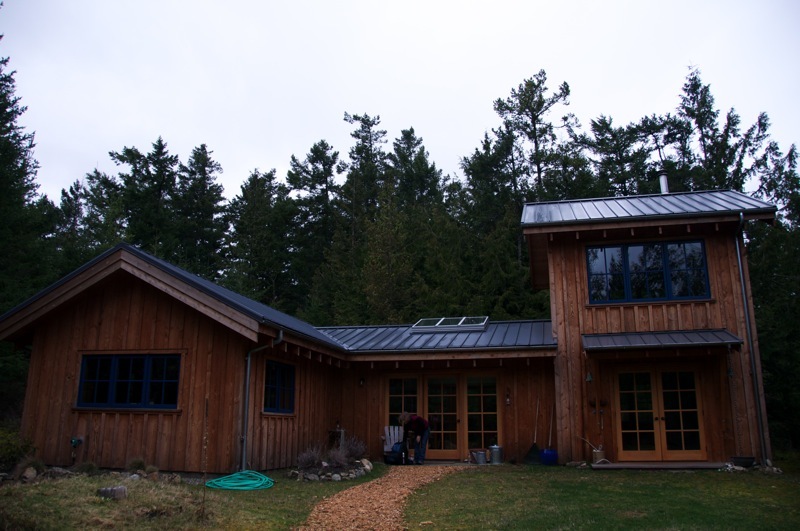 The simple house is built of wood milled on Orcas Island, with a steel roof common to the area. When they don't have visitors, Shawna and Leon are voracious morning-time readers. With no internet access in their house, they are able to satisfy their curiosity reading books and discussing what they've learned. It was a reminder to us of how distracted we are by our 24/7 access to the internet and the expectations of uninterrupted communication, which often prevent us from delving more deeply into topics of interest to us. We worked hard during the day. But that didn't keep us--or them--from taking advantage of the beauty of the area. We were able to get out for walks as well as paddles, and it was clear that they had not lost track of how remarkable it is to live in an area with such natural appeal. A walk just outside of East Sound. A paddle to Obstruction Island offered opportunities to play in eddy lines and ferry across current. 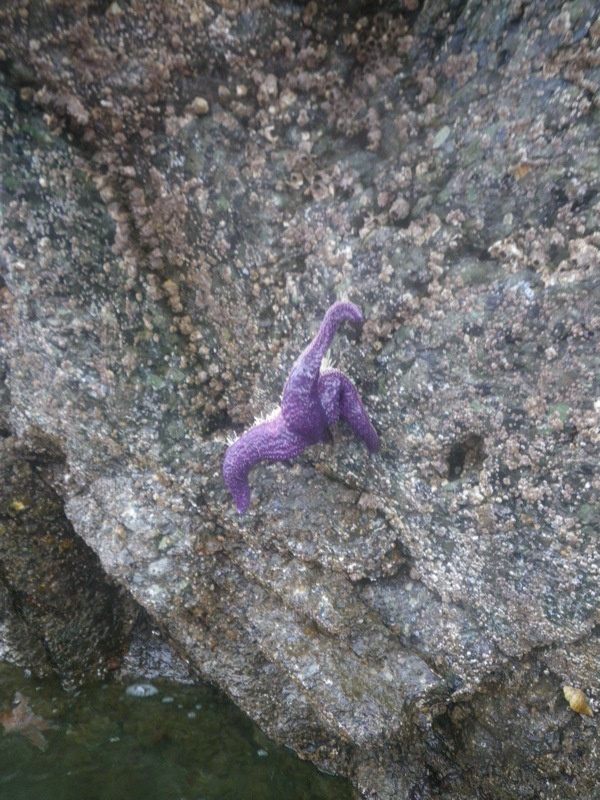 This little guy was hanging on by a thread. By the time we returned to our home in the barn, the sun had set and it was time to light the candles again. It's a life we could get used to, and over the course of a week we started to feel as though we had. 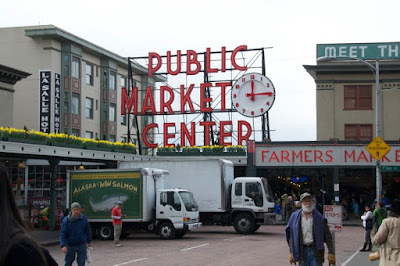 We had only 24 hours in Seattle -- just long enough to visit Snapdragon and Werner and wander around a bit in the historic Pike Place Market. 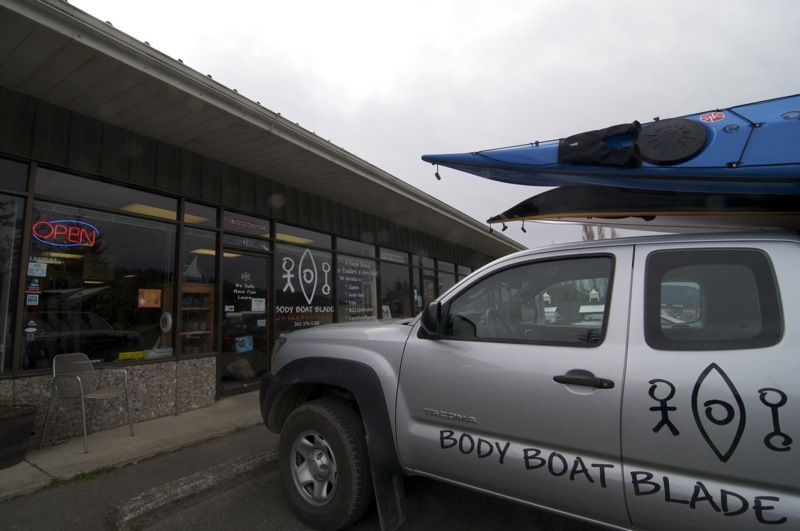 On Thursday afternoon, Shawna Franklin and Leon Somme of Body Boat Blade picked us up in their canoe-topped car and we drove to Anacortes to catch the ferry to Orcas Island, where they and their business are based. Orcas Island is the largest of the San Juan Islands, located in northwest Washington state just east of Vancouver Island, Canada. 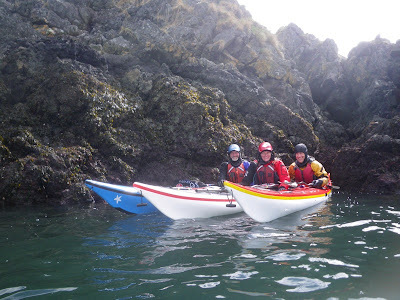 Nearly 58 square miles with a year-round population of about 5000 people, Orcas is a quaint and quiet place where you can paddle in a full range of coastal conditions. 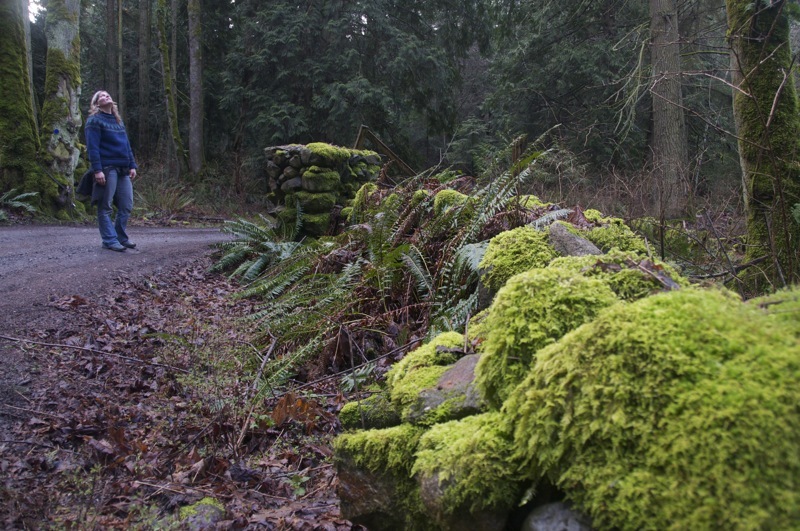 It's home to Moran State Park, with its mountain lakes, hiking trails and observation tower atop Mount Constitution. And it's home to Body Boat Blade International, where we had come to work on a project with Shawna and Leon. Body Boat Blade International galactic headquarters. 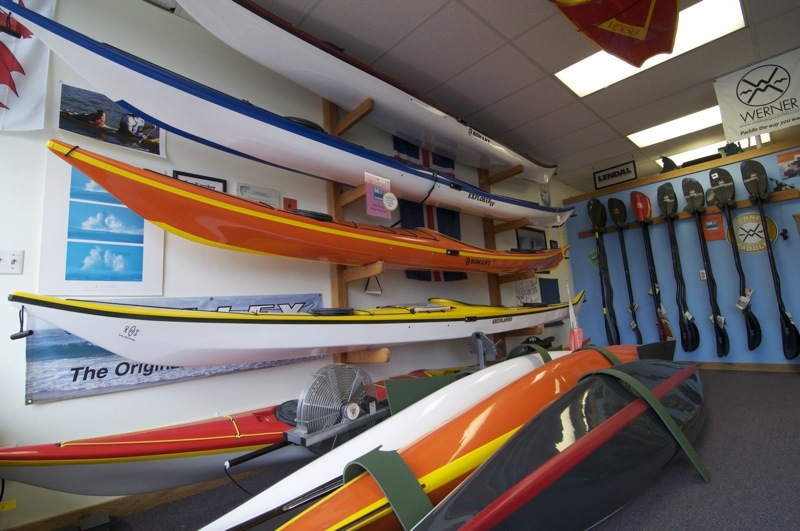 The small shop is well-stocked with high quality boats, paddles and gear. Shawna and Leon have carved out an unconventional life here. By day, they offer a full range of instruction at all skill levels. 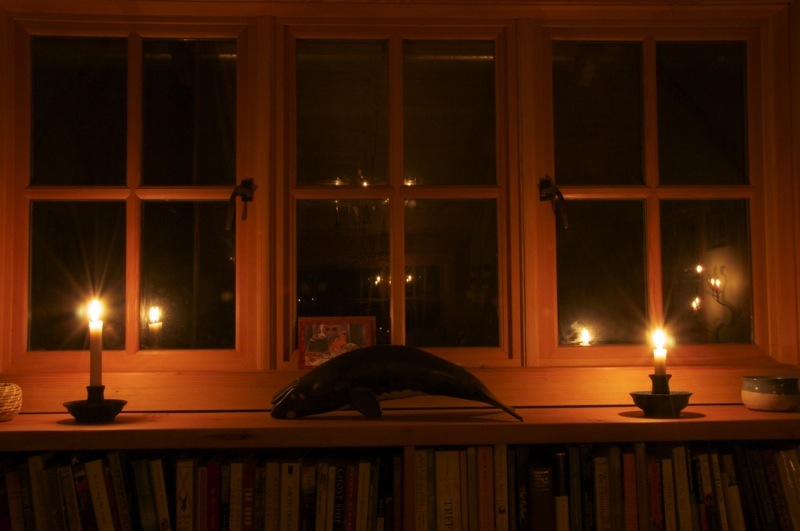 But when they're away from the shop and off the water, they live almost off the grid. 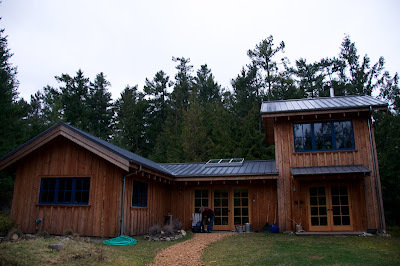 They put us up in the apartment above the barn, where they lived while building their current house. The barn is filled with boats, not animals. After blowing out the candles, we fell asleep to the sound of wind blowing through the trees. 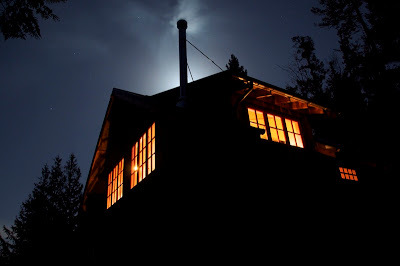 Our temporary home, lit by candles inside and the rising moon outside. 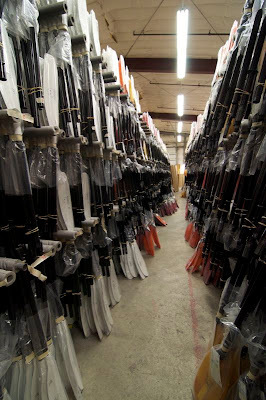 The Pacific Northwest is still home to many great paddlesports manufacturers, including several of our favorites. 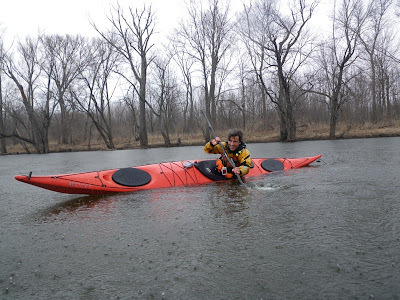 We couldn’t resist a visit to Werner Paddles, which have propelled us all over the Great Lakes, along parts of both coasts, and down several rivers and whitewater courses. 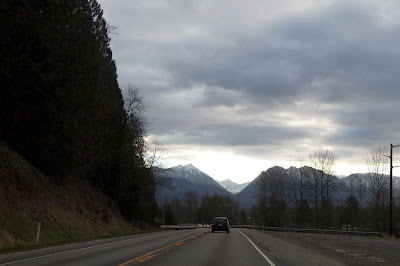 Even the drive there is beautiful, with snowy peaks in the distance and drive-through espresso shacks every few miles. At the recommendation of Werner rep Danny Mongno, we stopped at the Sultan Bakery, where we saw the largest “bear claws” ever. We recommend the apple-cinnamon muffins. You could easily drive by the Werner faculty without noticing it, not because it’s small but because it’s nondescript. Inside we were greeted by Shannon Davis, who warmly welcomed us and handed us off to Keith Krueger, production manager, for a tour. Werner has spent decades perfecting its paddles and the procedures by which they are made, so understandably we were asked not to photograph the actual production processes. 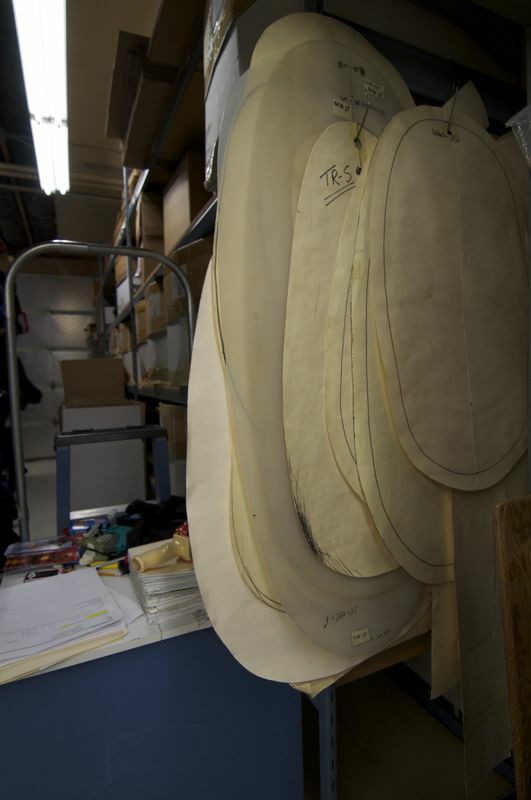 The surprise, for us, was how much of the process is still done by hand. Keith, Production Manager, holding what will soon become a paddle blade. Paddles, ready to "rocket out the door." 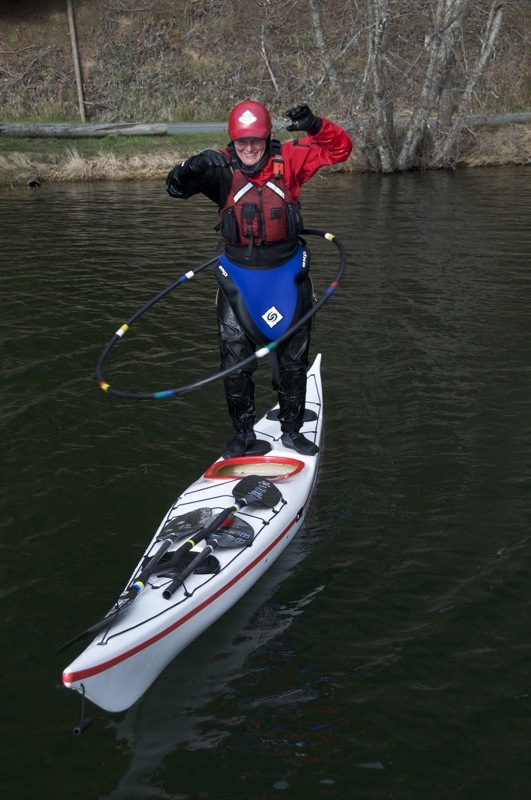 Stand-up paddling has been good for Werner. “The sport has taken off,” he notes, and Werner now offers several models of stand-up paddles. We walked through the process with him, from the making of straight and bent shafts (if you wonder why bend shafts are so much more expensive, here’s a quick fact: a worker can make 60 to 70 straight shafts in a day, but only 13 bent shafts), to the blade production area, to assembly, to finishing and quality control, to shipping. In parts of the factory, the workers wear ear protection, and in others they wear coveralls, but nearly everywhere they wear smiles. 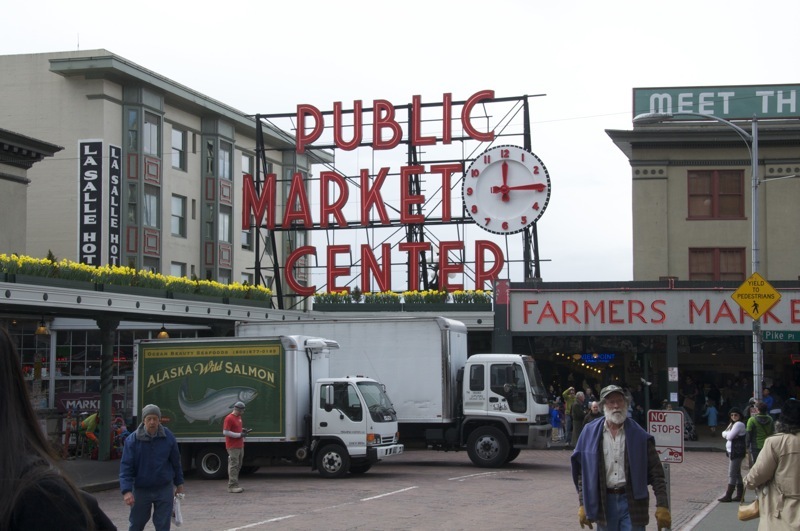 “It’s a great culture here and a fun industry and a cool end product,” Keith says. End of the line: Shipping. 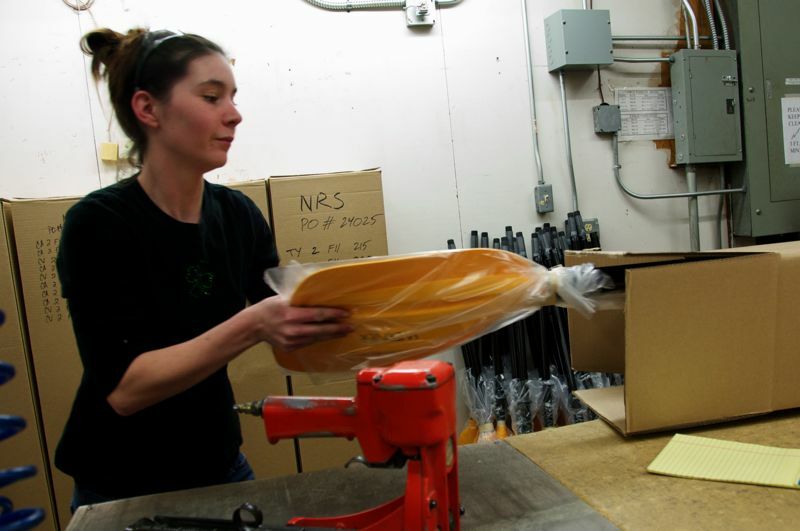 The women in customer service share that enthusiasm, and talk about the customer loyalty they see when people send a paddle in for a retrofit years or even decades after purchasing it. As loyal customers ourselves, we realize how easy it is to overlook the value doing that. We've long been fans of Snapdragon spray skirts. We still have our first skirts from years ago; they show their age, but still work well. Since then, we've purchased more Snapdragon skirts as our various boats with their many cockpit sizes have called for new ones. So when we had a one-day layover in Seattle, we decided to visit Richard Wilson, the founder and owner of Snapdragon Design, at Snapdragon World Headquarters. You are here! 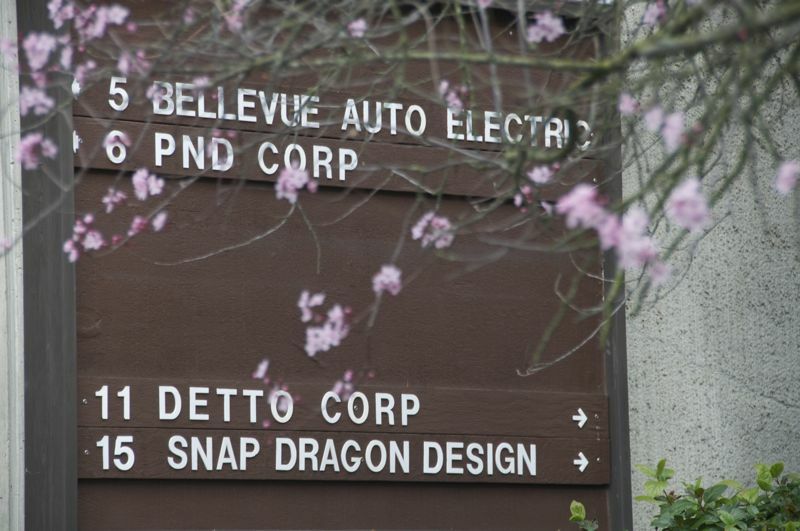 Snapdragon World Headquarters! 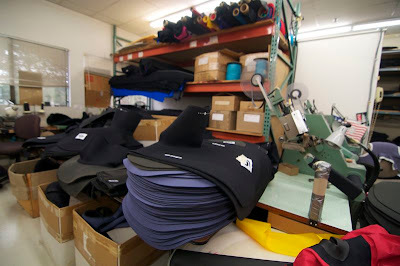 OK, so it's a small shop in an industrial strip mall, where five long-time employees and Richard himself produce about 5,000 to 8,000 skirts per year. The air smells like adhesive and neoprene, and the shelves are chock-a-block with the raw materials. This is hands-on, small-scale manufacturing of the most earnest and endearing sort. "We're the small guys," he says. 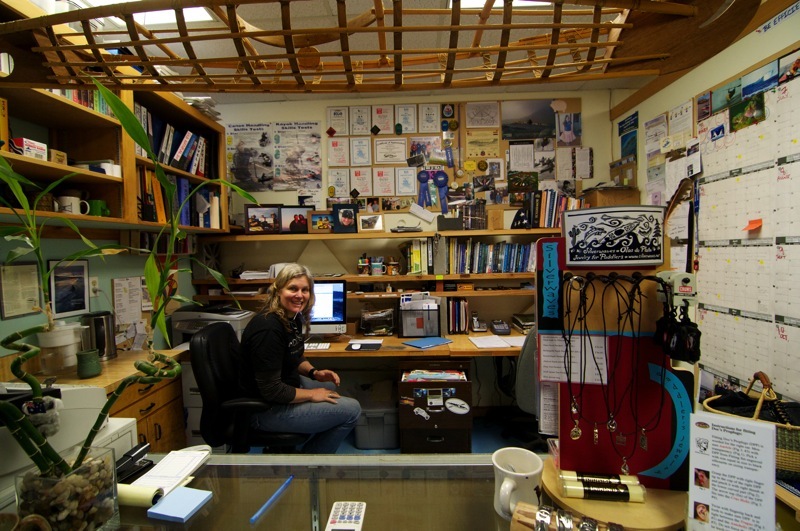 The shop is small; every inch of space is in use. Richard began sewing skirts in the 1980s, when he got into paddling and couldn't find a skirt he liked. He's still at it, making skirts for whitewater and sea kayaks as well as new products for recreational boats. 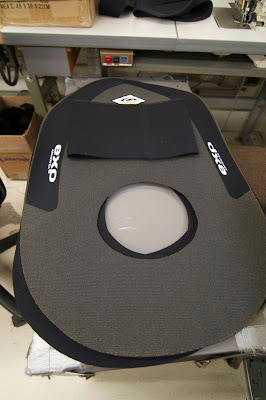 He also makes neoprene hatch covers and poagies. But the economy has taken a toll. Boat sales are down, and with them sales of spray skirts. 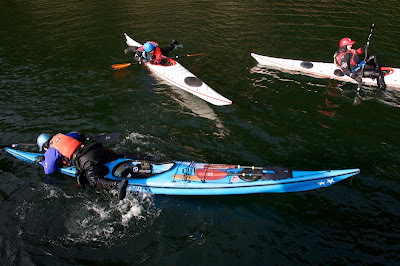 The booming part of the paddling world--Stand-Up Paddling (SUP)--doesn't require any neoprene. That's been tough. "Right now, it's about survival," he says. That plus a commitment to avoid laying off any of his employees. Patterns hang behind a sewing station after the employees have left for the day. But look around the shop, and it's just exciting. Richard is willing to make a custom skirt for just about any specific purpose. 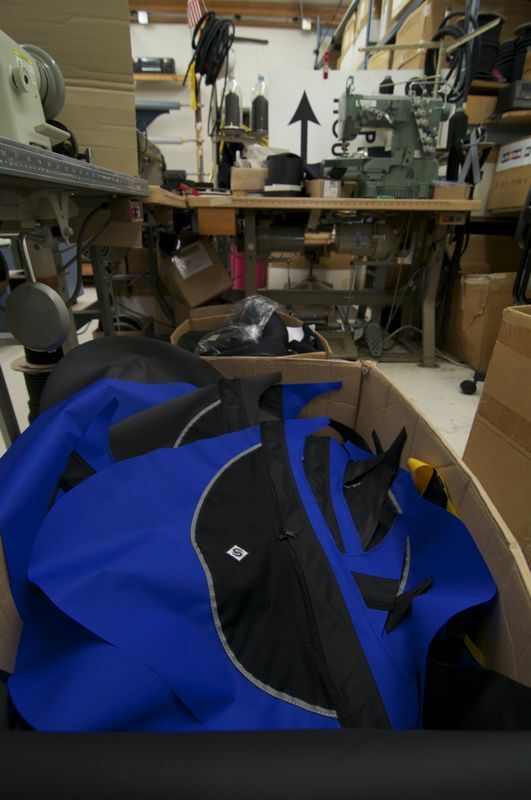 On one table, a couple of splash jackets are being retrofitted for integral spray skirts. On another, kevlar decks await their tubes. 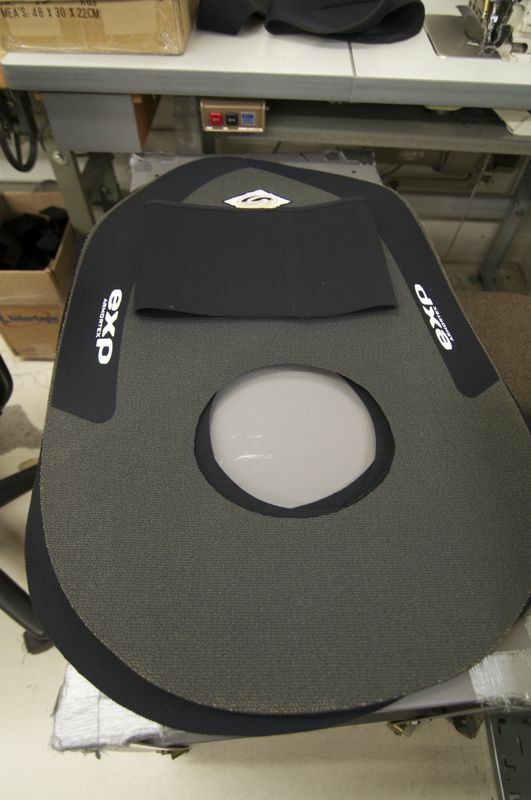 He's also recently come out with a sun deck for warm-water paddlers who just want sun and splash protection, and a breathable fabric skirt--both with pockets. "We're always building stuff," he says. Skirts in the production process, with one of the seam-taping machines standing by. Richard is a living piece of paddling history in the Pacific Northwest. He has watched the business boom, from the 1970s, when he and his friends had to make their own boats, through the 1990s, when paddlesports were flourishing and business was booming, through today's contraction. He's still in business because he believes in quality and customer service. 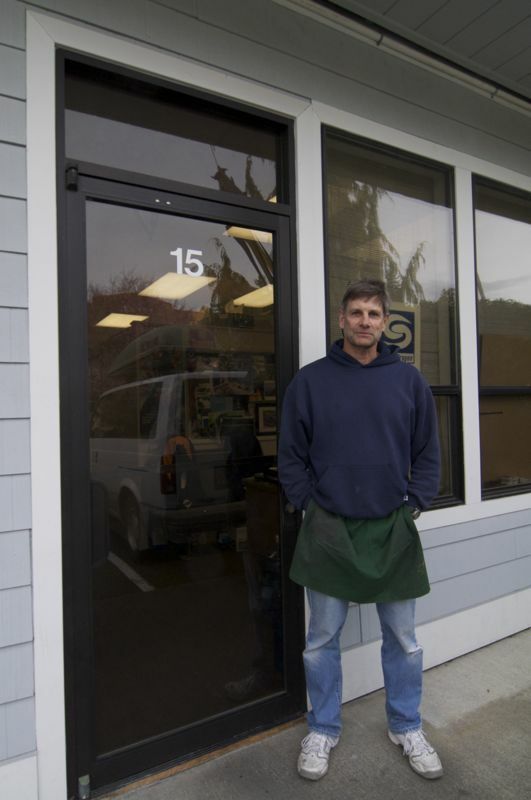 "We do everything here in our shop and we stand behind it," he says. 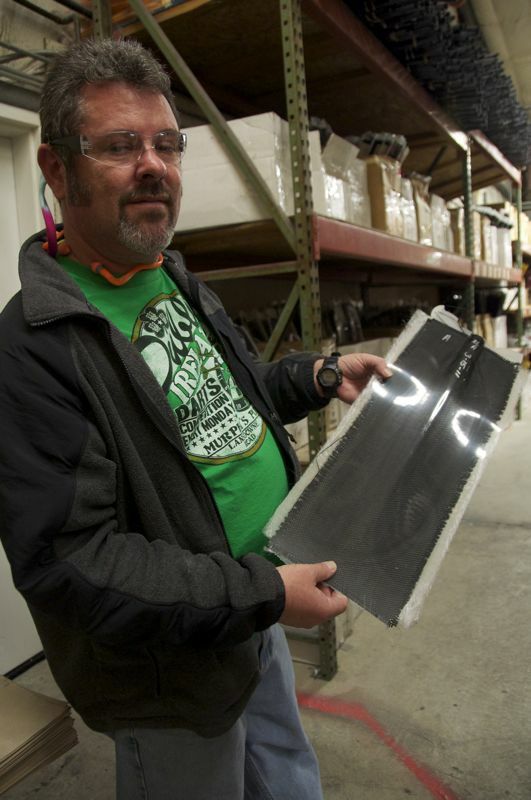 "If there's ever issues we can deal with it, and we use the best possible materials." 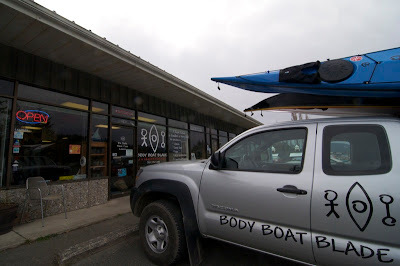 Visiting Richard reminded us of what a small world kayaking is, and how the businesses that supply it frequently are owned by people who have long been a part of the community. We would buy Snapdragon skirts even if we didn't know that doing so supported a small business committed to the sport. But knowing that makes us even more happy about closing that circle. Completed skirts, ready to ship. At the Valley booth, with boats all around. 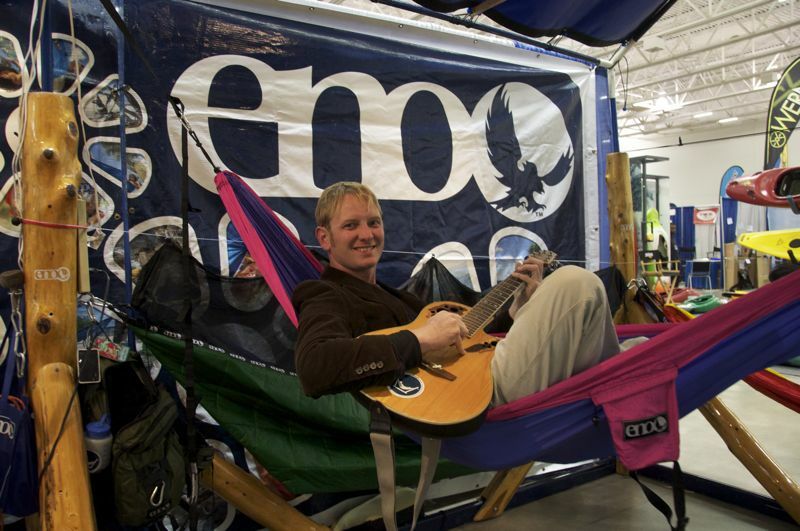 We've written about Canoecopia before. It's the largest paddlesport expo in the world, held in Madison, Wisconsin. 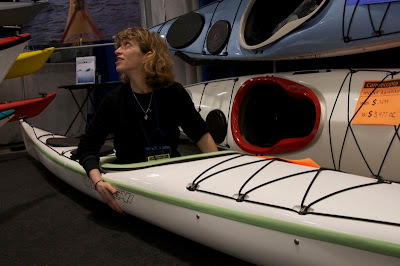 It attracts about 20,000 people who come to see the latest boats and gear, hear the presentations, and connect with paddling clubs, environmental organizations, and the community of fellow paddlers. 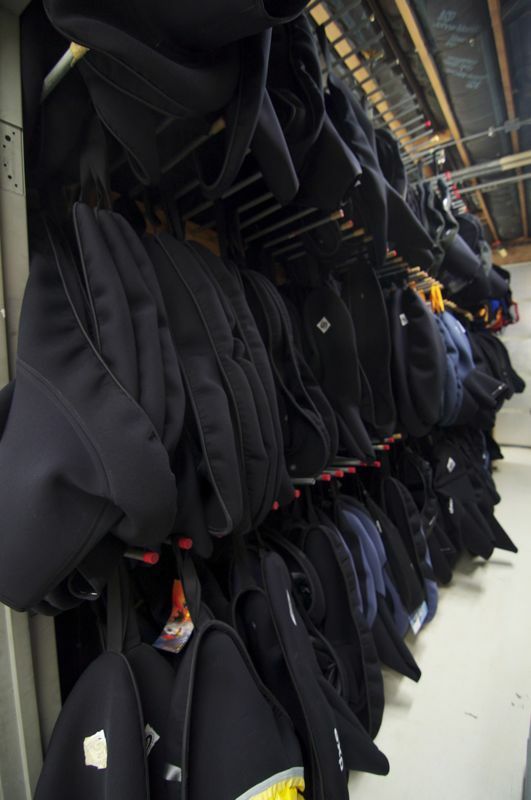 Every year, there's something new on the gear front. 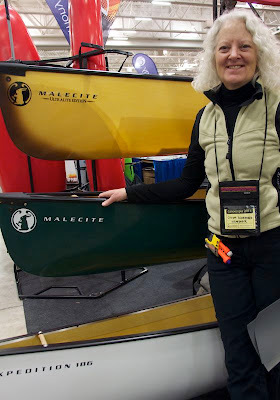 This year, we were eager to check out the P&H Delphin and the Valley Etain--especially the Etain LV, which was air-freighted in for this event. 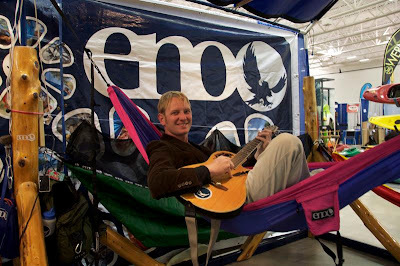 We're hoping to test the Etain this summer on something wetter than carpeting. 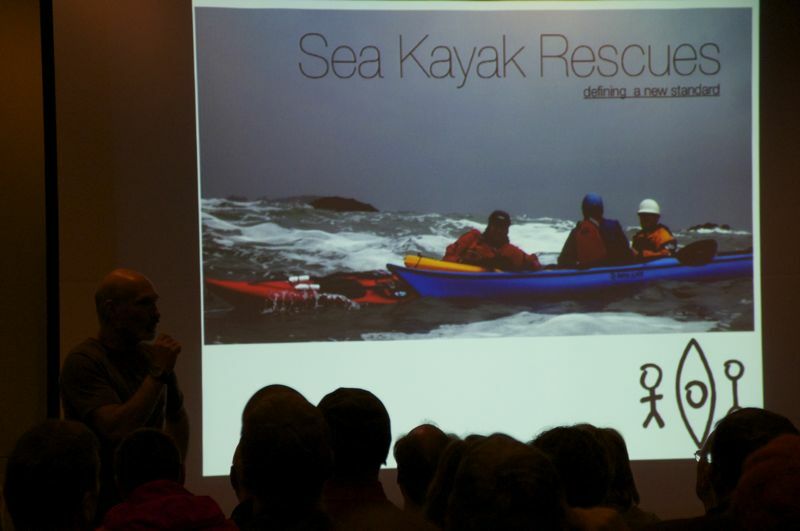 Shawna Franklin and Leon Somme showed a trailer from their upcoming sea kayak rescue video. Canoecopia offers nonstop presentations--a dizzying choice of about eight per hour, hour after hour, for three days. Choosing which to attend can be tough. 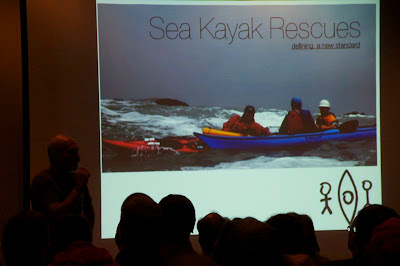 We attended one by Shawna Franklin and Leon Somme of Body Boat Blade, and another by Keith Wikle on surf kayaking. We also gave a couple of T-rescue presentations in the tiny pool. 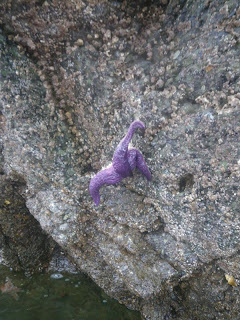 It was kind of like rock gardening, only without the moving water and with hard linear surfaces in lieu of craggy ones. Eighty enthusiastic people survived the heat and humidity in the pool area to see if we would scratch the new boats Valley lent us for our T-rescue demonstrations. We spent time wandering through the expo hall, catching up with friends and checking out the cool new stuff. 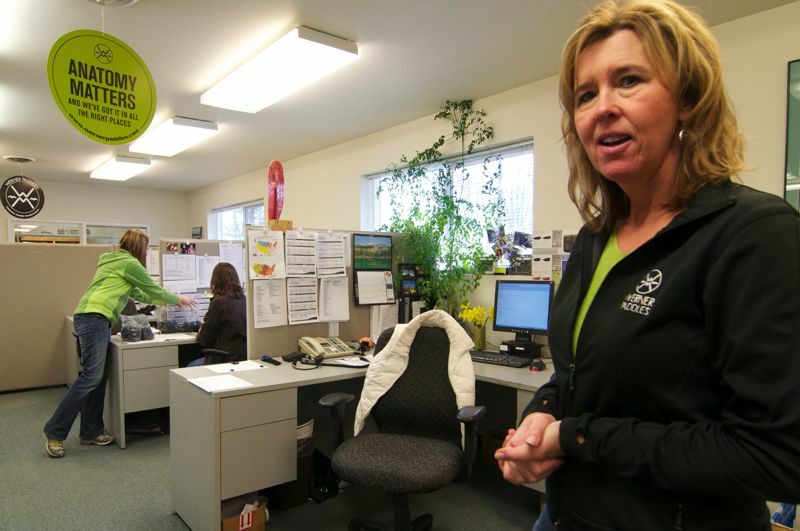 We're always happy to see Cindy Scherrer of Confluence Watersports. Hanging out with Keith around the campfire. The hallway was filled with tables staffed by clubs, organizations and nonprofits. The CASKA table got lots of traffic, as did others. 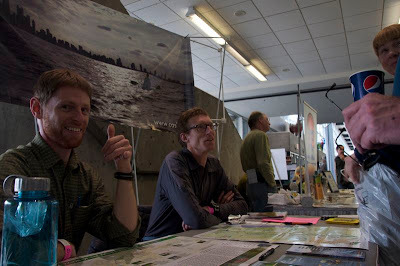 Chuck and Tom at the CASKA table. 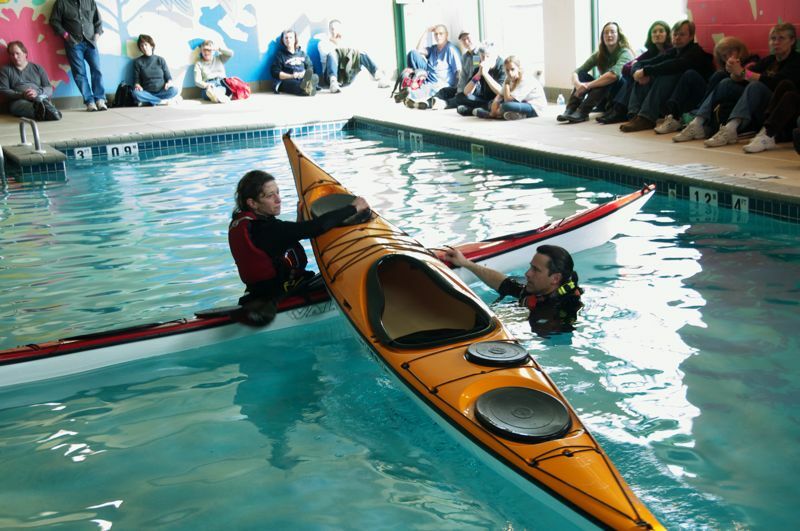 Canoecopia feels like the true start to the paddling season. We see a lot of smiling people, and always leave happy. Panoramic shot of the whitewater park and the new Geneva Kayak Outdoor Center. Most of the time, we drive east to paddle on Lake Michigan. But yesterday, we went west to Yorkville, Ill. to check out Geneva Kayak Center's new Yorkville Outdoor Center on the also-new Glen D. Palmer Whitewater Canoe/Kayak Chute. It's a nice location: the whitewater course is right outside the door of the outdoor center, and a concrete walkway allows paddlers to easily carry their boats from the bottom of the run back up to the top. The landscaping isn't yet done, and Geneva Kayak is still putting finishing touches on the shop, but both are ready enough for action. Sharon and Bill Burton putting in at the top of the chute. Mounds of debris and cement blocks testify to the recent completion of the chute and the work yet to come on the landscaping. 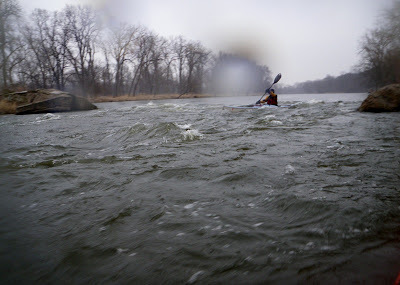 The river was high and the current was fast -- about 3,000 cubic feet per second (CFS) -- so we felt comfortable running it once in a fiberglass boat. 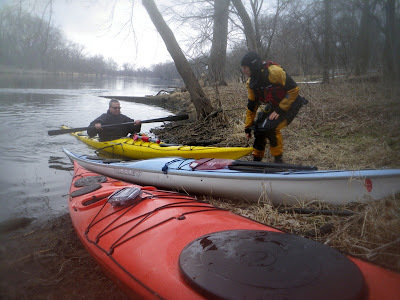 From there, we headed down the Fox River. 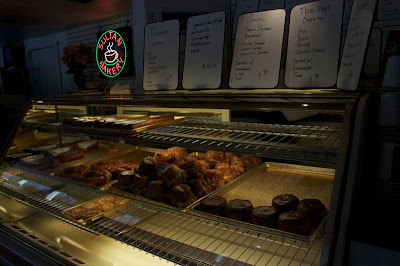 One of the appeals of Geneva's Yorkville Location is the easy access to a lovely section of the Fox. 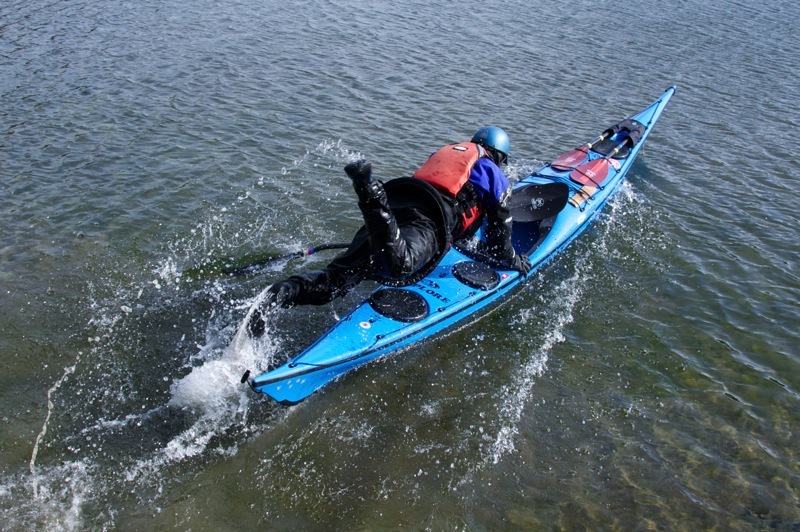 You can paddle various distances to a number of easy take-outs. At one point, we heard rapids and saw a horizon line ahead of us--the tell-tale signs of what could be a low-head dam. We knew that there was a broken-out dam at this point on the river and that it was runnable, but we decided to get out and scout anyway. Getting out to scout ahead. It turned out to be a broken-out dam of no significance, which we happily paddled through. All that sound didn't signify much. and even encountered a few small ice bergs floating along. 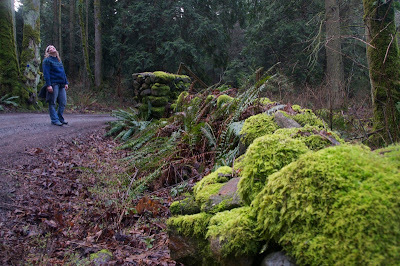 But mostly, we enjoyed a very quiet trip down a pretty section of the fox. 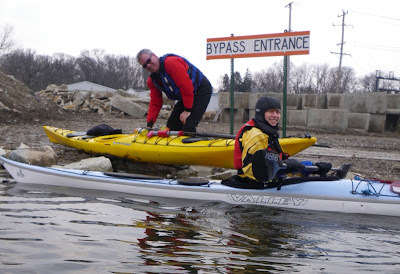 When we returned to Geneva Kayak Center, it was getting cooler and starting to rain more heavily, but we hopped in our whitewater boats and spent some time playing in the features. There were plenty of nice surf waves along with wave trains and squirrelly eddy lines. A serious play boater might find the offerings limited, but we appreciated the opportunity to paddle hard and tune up our rusty whitewater skills in our newer shorter boats. We drove home in the dark and the rain, reflecting on how wonderful kayaking outdoors makes us feel. 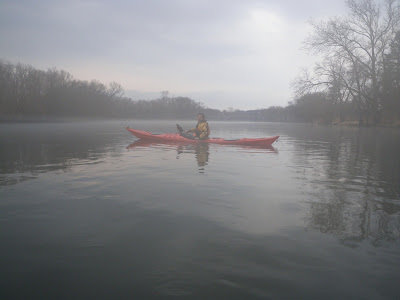 We appreciate the connection with the natural world and the physical pleasure of paddling our boats, and we always go home happy.